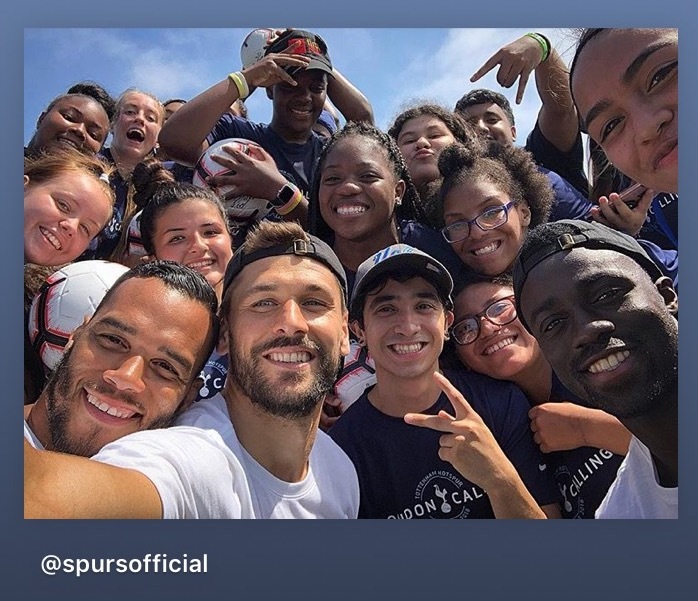 Five of our players paid a surprise visit to a special coaching session for local foster children’s project First Star in Los Angeles on Friday. Forty children from the project and their mentors joined our Global Football Development team for the session at Loyola Marymount University (LMU), our training base in LA. A few minutes into the session and who should turn up? Ben Davies, Fernando Llorente, Lucas Maura, Davinson Sanchez and Michel Vorm! The players were straight into the action, first joining in with a few coaching drills before splitting into teams and taking on player-coaching roles in small-sided matches. It was smiles all around as the children were all given a ball for the players to sign, everyone then posed for a group photograph before one more surprise – tickets for our International Champions Cup (ICC) match against Barcelona at the Rose Bowl. Donna Cullen, Executive Director, Tottenham Hotspur, said: “Children in care is one of the things we’re really passionate about and ‘To Care Is To Do’ is one of our long-running projects, one in which we invest a lot of time and energy. First Star’s Co-Founder and President, Peter Samuelson, added: “What we do in First Star is take rising Year Nines and bring them into a four-year programme, an Academy on the campus of a big university. They spend their summers residentially living in the dorm. It’s about a third academic, a third life skills and a third love, family, belonging – these are all children who have been abused or neglected and through no fault of their own. “If you are a foster kid we’re saying ‘no, you are not a victim, you are a survivor and you can be whatever you want to be, your future is up to you’. Less than six per cent of them would go to college but in our Academies, 91% of our Year 12s have gone into universities or colleges.